Stick it to your customers! 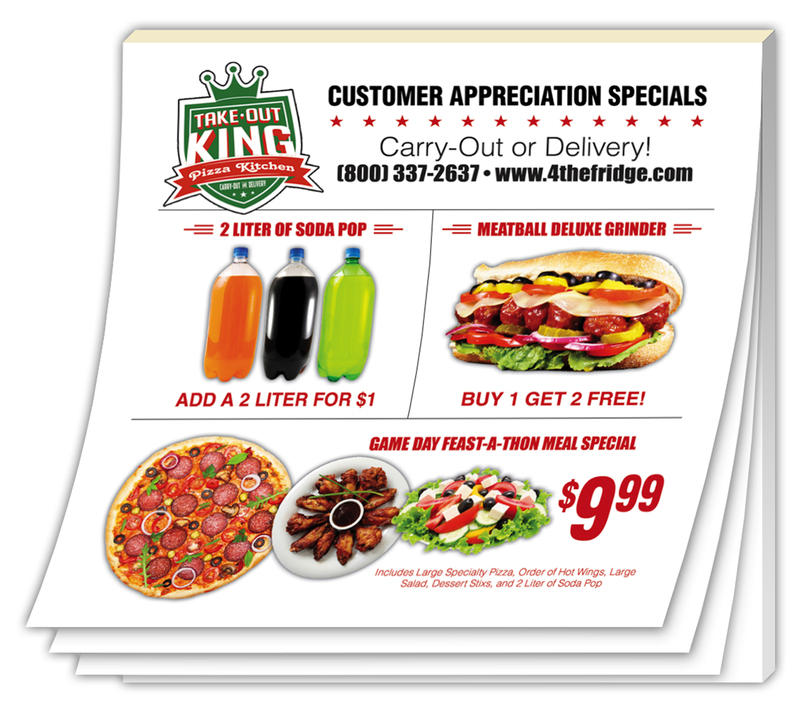 Full-color adhesive notes give you the opportunity to inform your customers of specials, new menu items, customer appreciation, apologies for order mistakes, upcoming events or promotions... whatever you can think of. Each sheet has an adhesive strip. The sticky back leaves no residue when removed. Material of note pad is 50 lb. offset. Padded on the 4 inch side only. 250 minimum. Price includes printing in full-color (four color process) on front of sheet. Exact color matches, metallic and fluorescent colors not available in full-color.We do not recommend the printing of type smaller than 8-pt in size due to legibility. Exact color matches, metallic or fluorescent colors cannot be printed in full-color (four color process).